Jimmy Smith, director general of the International Livestock Research Institute (ILRI) gave a keynote presentation this morning (17 Oct 2013) at the opening of the Global Animal Health Conference, ‘Developing global animal health products to support food security and sustainability’, in Arlington, Virginia. Smith began his presentation, ‘Global health and sustainable food security: Why the livestock sectors of developing countries matter’, by setting out the state of global food security and questioning how the world will manage to feed itself as the human population grows before stabilizing at about mid-century. Some 60% more food than is produced now will be needed by then, he said. And, somehow, some 75% of that increase will have to come from increases in productivity rather than from increases in land under cultivation. This higher production, he said, must be achieved while at the same time reducing poverty and hunger and addressing environmental, social and health concerns. In addition, the greater food production will have to be achieved in the face of temperatures 2−4 degrees C warmer than today’s. He pointed out the great nutritional divides in today’s world, and warned of malnutrition’s huge financial as well as public health costs. 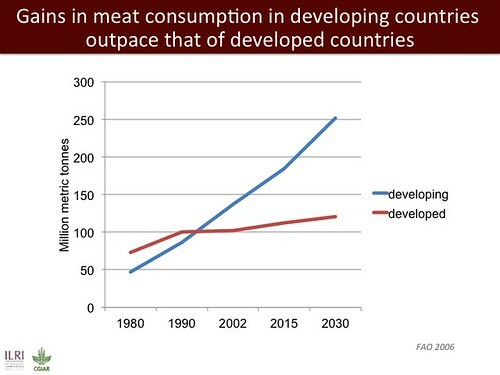 He noted that gains in consumption of meat in poor and emerging economies are greatly outpacing those of the industrialized countries. Smith then pointed out how much of the world’s food comes not from large-scale farmers but rather from hundreds of millions of very small-scale farmers in developing countries. These small-scale food producers, he said, are more competitive than most people think. He cited two examples. In East Africa, one million smallholders keep Africa’s largest dairy herd, Ugandans produce milk at the lowest cost in the world, and Kenya’s small- and large-scale poultry and diary producers have the same levels of efficiency and profits. In Vietnam, 50% of the country’s pig production is done by farmers with less than 100 pigs, and producers keeping just 1 or 2 sows have lower unit costs than those with more than 4 sows. Scientists estimate that Vietnam’s industrial pig production could grow to meet no more than 12% of the national pig supply in the next 10 years, so small-scale farmers will continue to supply most of the country’s pork for the foreseeable future. 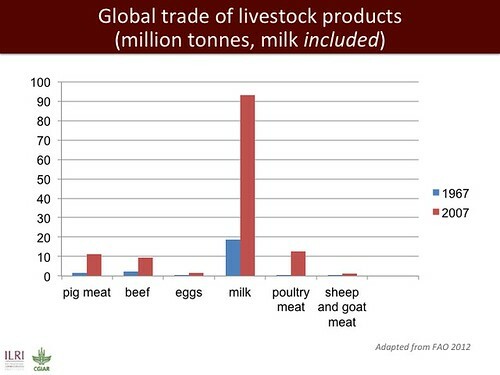 In a series of graphs, ILRI’s director general presented figures for livestock commodities being global leaders, for the huge global trade in livestock products and for the fast-rising demand for meat, milk and eggs in developing countries. 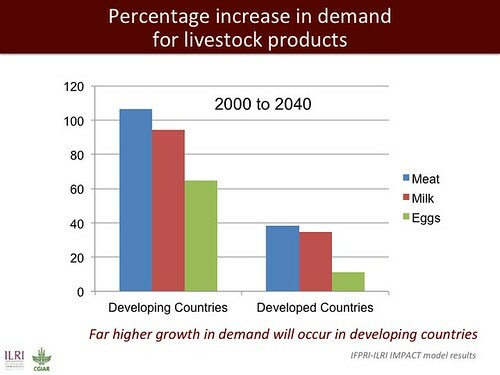 Smith said that the developing world’s smallholder livestock producers can continue to produce most of the world’s milk, meat and eggs only if we can find ways to improve livestock health, especially by reducing food safety problems that reduce market participation by smallholders, by reducing the endemic livestock diseases that greatly lower livestock productivity in developing countries, and by lowering zoonotic disease transmissions that threaten small-scale livestock production in poor countries—as well as human health in all countries. Food safety in developing countries, where most milk, meat and eggs are sold in informal or ‘wet’ markets, is a bigger problem than most people recognize, the ILRI director general said. He said we need to manage the risks of illness while retaining the benefits—to livelihoods and food and nutritional security—of informally sold livestock foods. And, he said, we have to educate people about the various risks of these informal markets, where common perceptions can be misleading; eating vegetables sold in these markets, for example, can be as risky to health as handling cattle or drinking raw milk. Gender is an important determinant of food safety in developing countries, Smith said, with evidence indicating that Africa’s women butchers sell safer meat than their male counterparts. Women and children and farm workers are also at greater risking in contracting food-borne diseases. Regarding health advice, Smith argued that it is most useful when it is tailored for specific circumstances, when it is based on evidence, and when it is developed in and with local communities. It’s also been found that what works best for increasing food safety are social incentives (e.g., ‘good parents do X rather than Y with their milk cows’), and risk- rather than rule-based approaches. Finally, he said, relatively simple and cheap interventions can lead to substantial improvements in food safety. 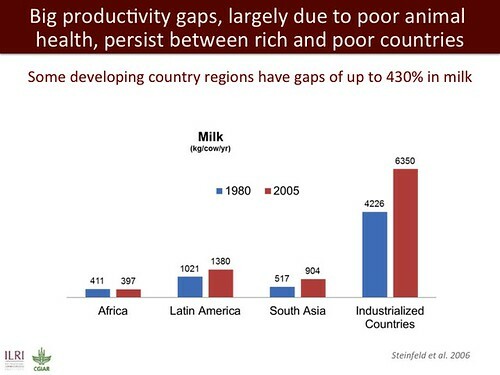 The big livestock productivity gaps between rich and poor countries, Smith explained, are due largely to poor animal health in these countries. 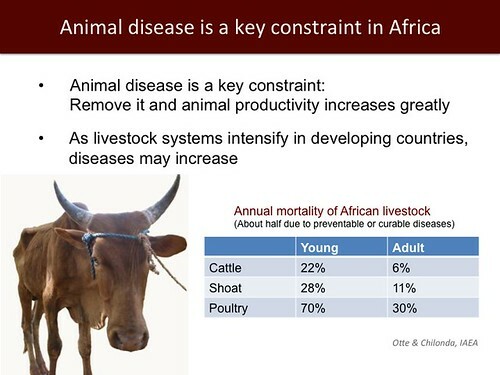 Livestock diseases take a huge toll . . .
. . . especially in Africa. 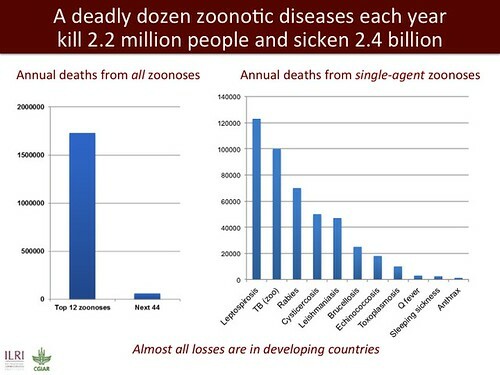 And the toll from ‘zoonotic’ diseases, which are transmitted from animals to people, is especially devastating. 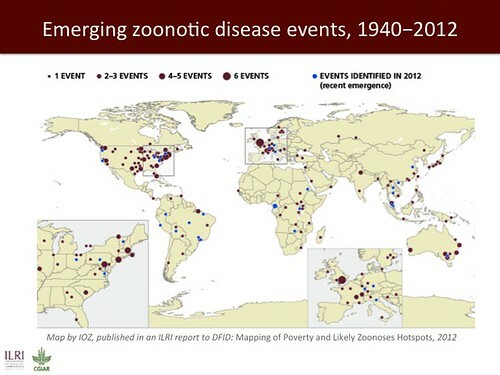 These zoonotic infections harm poor people the most. 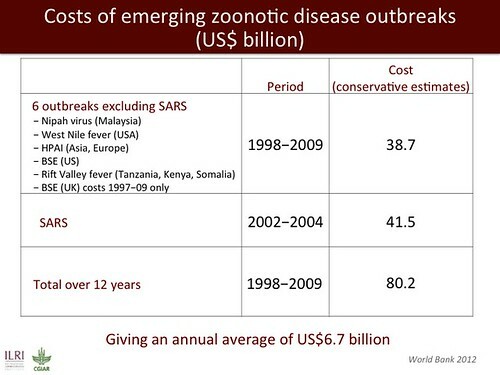 Incidences of zoonotic events are worringly on the increase . . .
. . . and can have enormous costs . . .
. . . as they spread, just as African swine fever is now spreading. 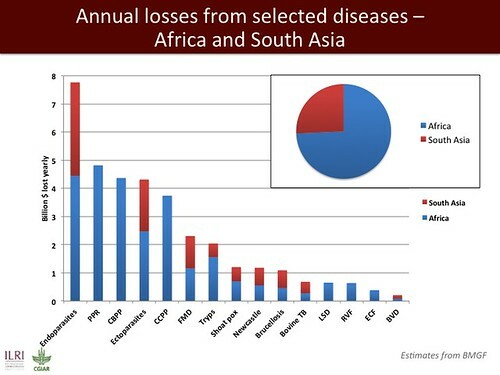 The animal health markets in developing countries are already significant and are growing rapidly. 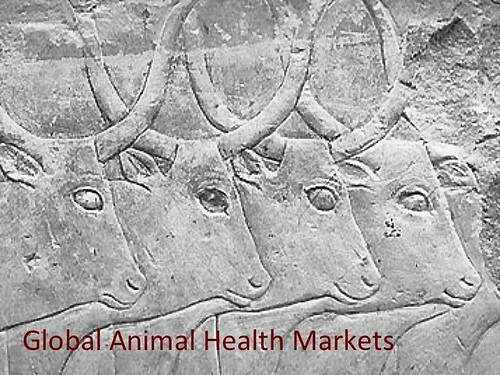 The global animal health market is a multi-billion-dollar industry. 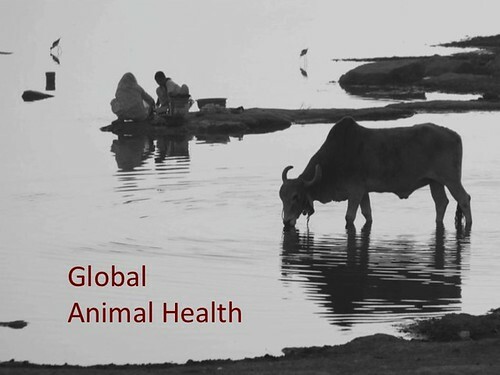 The global human health market amounts to US$1000 million and the global animal health market, including livestock, pets and other animals, some $20 billion. 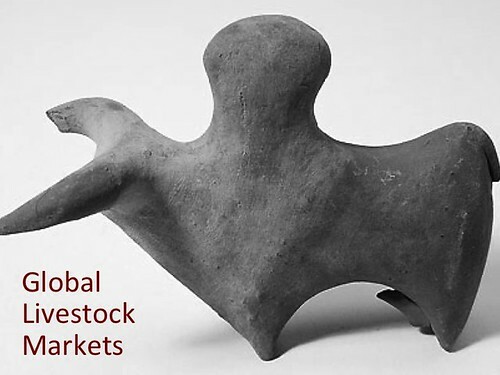 The global livestock health market is worth about $13 billion, with the livestock health market in Africa now experiencing a 15.7% year-on-year growth (the second fastest growth after Latin America). 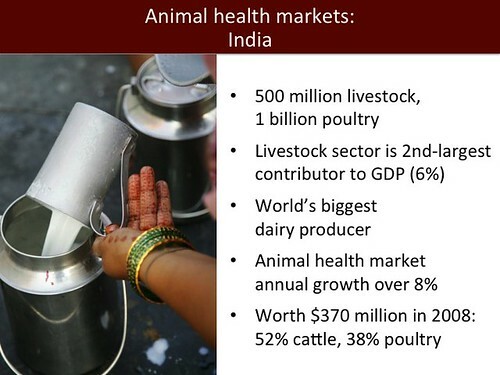 Just 15 countries make up more than 85% of the global animal health market today; demand for animal health markets in developing and emerging economies is increasingly important. 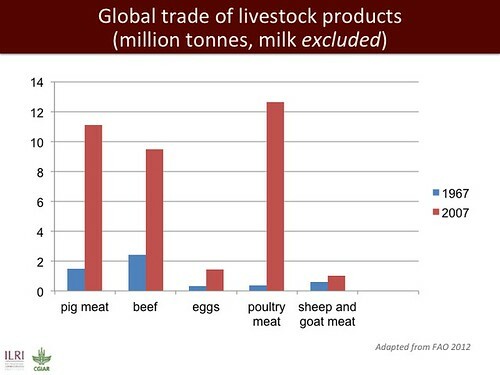 To take advantage of the increasing opportunities in developing countries will require an understanding of smallholder livestock systems and customers, who will need tailored packaging and marketing (e.g., drugs in small packets), delivery systems appropriate for widely dispersed farms, surveillance systems for development of drug resistance, and ‘One Health’ approaches and ‘Rational Drug Use’ used for both people and their animals. Among the ‘game-changing’ livestock health products urgently needed in poor countries and communities are appropriate vaccines for Newcastle disease in poultry and East Coast fever in cattle and quality assurance for all veterinary medicines. And he closed his presentation the following thoughts. The opportunities for improving animal health in developing countries are just as big. 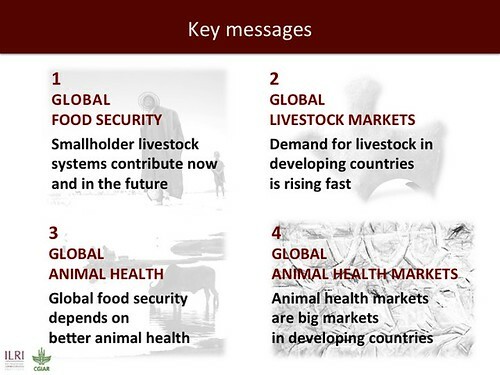 With appropriate approaches, this significant animal health market should grow rapidly, for the good of all. More presentations by Jimmy Smith. 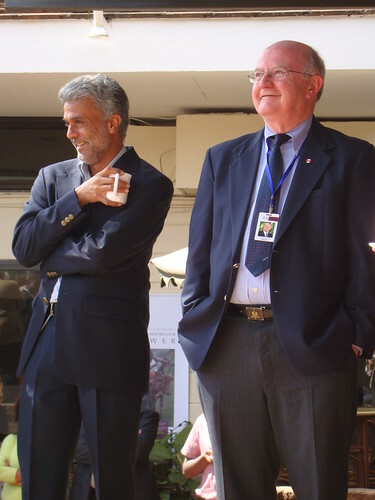 Director of ILRI’s vaccine development program Vish Nene (left) with Canadian vaccinologist and ILRI board member Lorne Babiuk (right) at morning tea with ILRI staff (photo credit: ILRI/Susan MacMillan). Canadian Lorne Babiuk, an internationally recognized leader in vaccine research, visited the International Development Research Centre (IDRC) in Ottawa yesterday (8 Oct 2013) to deliver a live webcast talk on exciting breakthroughs in the development of animal vaccines, which, he argued, can both improve global food security and reduce the global impacts of infectious diseases. Babiuk is vice-president of research at the University of Alberta and the recipient of two recent distinguished awards for his outstanding career in vaccinology — the Gairdner Wightman Award in 2012 and the Killam Prize in Health Sciences in 2013. He serves on the board of trustees of the International Livestock Research Institute (ILRI). For all his illustrious awards, Babiuk talked not like a scientist but rather like ‘a regular guy’, preferring to speak of ‘scissors’ and ‘crazy glue’ to describe molecular advances in vaccinology rather than use scientific jargon. Here’s some of what he said. One billion people go to bed hungry every night. Not hungry like you and me when we miss a meal. But hungry, really hungry, every day, day in and day out. By 2050, we’ll have another 2 billion people to feed. The last time I checked, they were not making more land. So we’re going to have to do more with the land (and livestock) that we have. 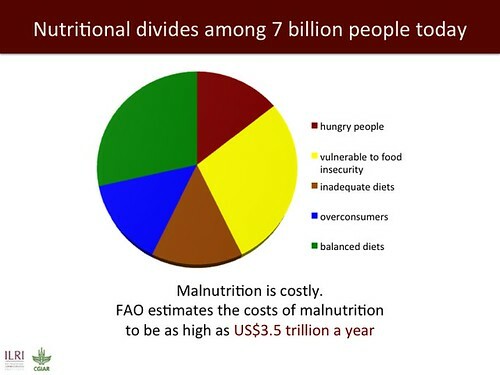 We have an opportunity to develop new approaches to increase food supplies or to have a lot more hungry people. 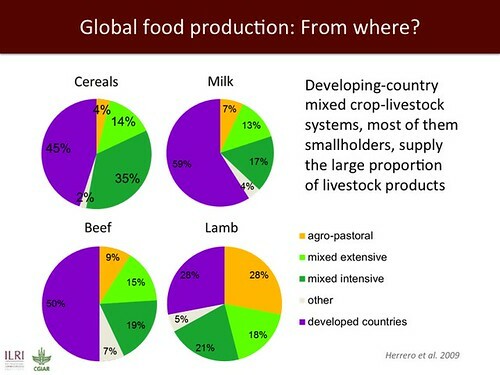 The developing world is looking for more and more protein; those of us in the developed world should not deny them that. I’ve spent my career in infectious diseases. They matter partly because they cost so much. Alberta has still not recovered from BSE. And SARS cost a staggering USD100 billion—USD2 billion in Ontario alone. Some 74% of new or emerging diseases are ‘zoonotic’, which means they’re transmitted from animals to humans, or from humans to animals. 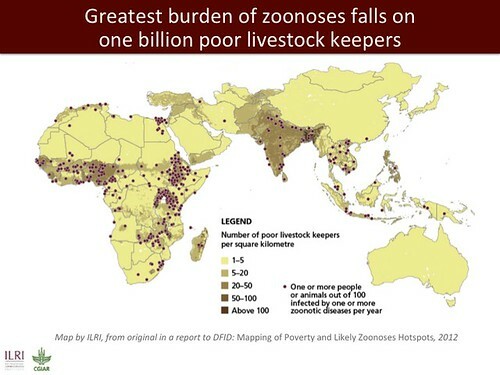 The economic impacts of zoonoses are huge for farmers, for producers, for international traders . . . I have concerns about Rift Valley fever spreading to North America. The West Nile virus, which has the same kind of vector, has already arrived here. Basic research and applied research are two sides of the same coin—the two of them need each other. We no longer train our biologists in broad biology but rather in narrower molecular biology studies. That’s a mistake. We biological scientists must get smarter at engaging social science and scientists. Vaccination has saved more lives than all other treatments and prophylactics combined. The traditional types of vaccines, live or killed, have given way to really interesting new types. We eradicated smallpox with a vaccine; that research would never be approved today because the vaccine has too many side effects. What can we do to change perceptions of vaccines and biotechnology? It costs something in the order of one billion dollars to get a vaccine approved. The major obstacle in Africa is to get a commercial company to invest in the regulatory component of a vaccine because there isn’t a financial incentive. You can’t sell a livestock vaccine for much more then 50 cents per dose in a developing countries. That’s why we have to work with African or Asian vaccine companies, which can produce vaccines much cheaper than industrial countries can. Several diseases in the developing world are protozoan and those are, of course, much bigger challenges. But there have been new donors for protozoan vaccine research. We need to convince more donors that this research is needed. I’m an evangelist for vaccination because I think we have lost the battle to the anti-vaccine lobby. In North Amercia there is a huge anti-tech group. They misquote or use data to push their own agenda at the expense of large numbers of lives lost. Look at the article published decades ago about a possible link between vaccination and autism. Despite decades of subsequent research showing no such links, we still haven’t managed to convince a lot of people that vaccines do not cause autism. How do we encourage the scientific community to stand up and be more vocal about what they know? We have to continue to advocate and demonstrate what we can do using the new technology. We should promise less and deliver more. We have been our own worst enemies. We have to be realists and say what can be done in what time period. That will give us back some credibility. People go into science because they like doing the science part of it. If they loved the podium, they would have gone into the social sciences. We need to encourage others to do this kind of communication. Any successful researcher has to stimulate the team around him or her and make them all feel part of something big. Getting people excited about working together as a team, providing a vision, and saying how the team can achieve something, that’s what I’m good at. Get people passionate about something and get them to know it’s their idea. I’m a facilitator. I don’t tell people what to do. I create an environment that facilitates what they do. You have to accept different cultures, different ways of doing science. You have to have patience and go with the flow. I learned patience. I still get up in the morning and put one leg in my pants and then the other, just like everyone else. Lorne Babiuk manages a grant funded by the Canadian International Food Security Research Fund (CIFSRF), among others. CIFSRF is a CA$124.5-million program of IDRC undertaken with financial support from the Government of Canada. 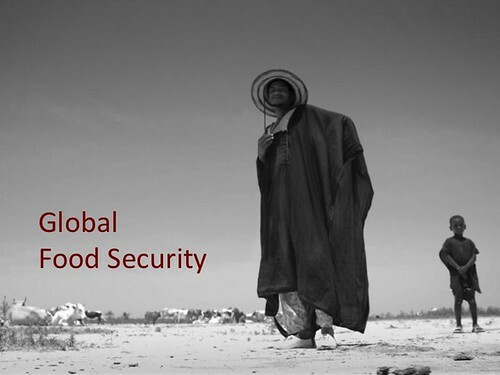 CIFSRF supports applied research partnerships between Canadian and developing-country organizations to find lasting solutions to hunger and food insecurity. It is a core element of Canada’s Food Security Strategy. For more information, see the IDRC website. A report on the economic as well as health risks of keeping free-range pigs in western Kenya has been published by scientists in the animal health laboratories at ILRI’s Nairobi, Kenya, campus; here, two of the authors, lead author Lian Thomas (left) and principal investigator Eric Fèvre (right), inspect a household pig in their project site, in Busia, in western Kenya (photo credit: ILRI/Charlie Pye-Smith). Like your livestock products to come from free-range systems? 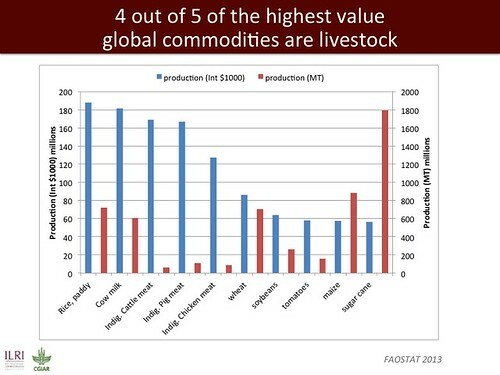 Consider that a healthy alternative to the factory farming of livestock? Consider the lowly pig, and what serious pathogens it can pick up, and transmit to other animals and people, in the course of its daily outdoor scavenging for food. Consider also the scavenging pig’s coprophagic habits (consumption of faeces) and you may change your mind. A recent study has brought those habits to light. The study was conducted in an area surrounding Busia town, in western Kenya (Busia lies near Kenya’s western border with Uganda; Lake Victoria lies to the south). The study was conducted by scientists at the International Livestock Research Institute (ILRI) and the University of Edinburgh to better understand the transmission of several pathogenic organisms. This is the first study to investigate the ecology of domestic pigs kept under a free-range system, utilizing GPS technology. Most people in Busia farm for a living, raising livestock and growing maize and other staple food crops on small plots of land (the average farm size here is 0.5 ha). More than 66,000 pigs are estimated to be kept within a 45-km radius of Busia town. 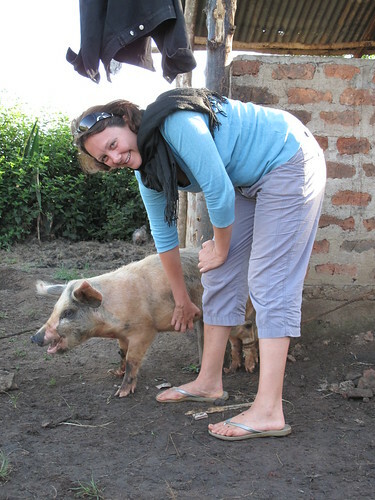 ILRI’s Lian Thomas with a household pig in western Kenya (photo credit: ILRI/Charlie Pye-Smith). A GPS collar was put on 10 pigs, each nearly 7 months old, that were recruited for this study. A handheld GPS unit was used to obtain the coordinates of the homesteads to which the selected pigs belonged; the perimeters of the homesteads and their main features, including human dwellings, cooking points, rubbish disposal areas and latrines, were all mapped. The pig collars recorded the coordinates of the pigs every 3 minutes during the course of one week. All the 10 pigs were kept under free-range conditions, but also regularly fed supplementary crop and (mostly raw) household waste. All the pigs recruited were found to be infected with at least one parasite, with most in addition also having gastrointestinal parasites, and all carried ticks and head lice. The pigs, which scavenge both day and night, were found to spend almost half their time outside the homestead, travelling an average of more than 4 km in a 12-hour period (both day and night), with a mean home range of 10,343 square meters. One implication of this is that a community approach to better controlling infectious diseases in pigs will be better suited to this farming area than an approach that targets individual household families. Three of the ten pigs were found to be infected with Taenia solium, a pig tapeworm whose larva when ingested by humans in undercooked pork causes the human disease known as cysticercosis, which can cause seizures, epilepsy and other disorders, and can be fatal if not treated. T solium infection in pigs is acquired by their ingestion of infective eggs in human faecal material, which is commonly found in the pigs environments in rural parts of Africa as well as Mexico, South America and other developing regions. This study found no correlation between the time a pig spent interacting with a latrine at its homestead and the T solium status of the pig. 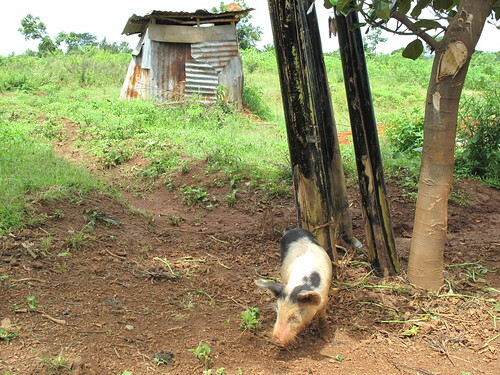 The paper’s authors conclude that ‘the presence or absence of a latrine in an individual homestead is of less relevance to parasite transmission than overall provision of sanitation for the wider community in which the pig roams’. With a quarter of the homesteads in the study area having no access to a latrine, forcing people to engage in open defecation, and with less than a third of the latrines properly enclosed, there are plenty of opportunties for scavenging pigs to find human faeces. A typical household scavenging pig and pit latrine in the project site in Busia, Kenya (photo credit: ILRI/Charlie Pye-Smith). Improved husbandry practices, including the use of effective anthelmintics at correct dosages, would enhance pig health and production in this study area. One of the interesting findings of the study is that all this pig roaming is likely to be helping to reduce the weight of the pigs at slaughter. Mean live weights at the abattoir in the Busia area are 30 kg, giving a dressed weight of only 22.5 kg and earning the farmer only KShs.2000–2500 (USD24–29) per animal. Encouraging the confinement of pigs is likely to improve feed conversion and weight gain, by both reducing un-necessary energy expenditure as well as limiting parasite burden through environmental exposure. 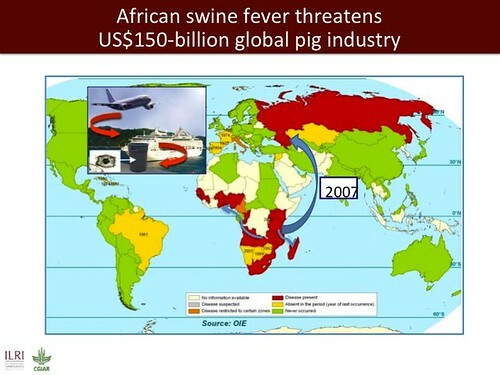 ‘Confinement of pigs would also reduce the risk of contact with other domestic or wild pigs: pig to pig contact is a driver of African swine fever (ASF) virus transmission. 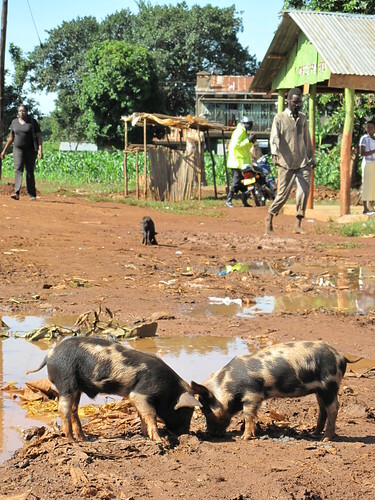 ASF regularly causes outbreaks in this region . . . . Confining pigs within correctly constructed pig stys would also reduce the chances of contact between pigs and tsetse flies.’ That matters because this western part of Kenya is a trypanosomiasis-endemic area and pigs are known to be important hosts and reservoirs of protozoan parasites that cause both human sleeping sickness, which eventually is fatal for all those who don’t get treatment, and African animal trypanosomiasis, a wasting disease of cattle and other livestock that is arguably Africa’s most devastating livestock disease. In addition, both trichinellosis (caused by eating undercooked pork infected by the larva of a roundworm) and toxoplasmosis (caused by a protozoan pathogen through ingestion of cat faeces or undercooked meat) are ‘very real threats to these free-ranging pigs, with access to kitchen waste, in particular meat products, being a risk factor for infection. Such swill is also implicated in ASF transmission’. While confining pigs would clearly be advantageous for all of these reasons, the practice of free range will likely be hard to displace, not least because this low-input system is within the scarce means of this region’s severely resource-poor farmers. Local extension services, therefore, will be wise to use carrots as well as sticks to persuade farmers to start ‘zero-scavenging’ pig husbandry, Fortunately, as this study indicates, they can do this by demonstrating to farmers the economic as well as health benefits they will accrue by penning, and pen-feeding, their free-ranging pigs. Scavenging pigs in Busia, western Kenya (photo credit: ILRI/Charlie Pye-Smith). This research was supported by the Wellcome Trust, BBSRC (Biotechnology and Biological Sciences Research Council) and MRC (Medical Research Council), all of Great Britain. It is also an output of a component of the CGIAR Research Program on Agriculture for Nutrition and Health investigating Agriculture-Associated Diseases. http://www.biomedcentral.com/1746-6148/9/47 The publication date of this article is 7 Mar 2013; you will find here a provisional PDF; fully formatted PDF and full text (HTML) versions of the paper will be available soon. Begun in 2009 and funded by the Wellcome Trust, with other support from ILRI, this project has studied neglected zoonotic diseases and their epidemiology to raise levels of health in poor rural communities. The project, People, Animals and their Zoonoses (PAZ), is based in western Kenya’s Busia District and is led by Eric Fèvre, who is on joint appointment at ILRI and the University of Edinburgh. More information can be found at the University of Edinburgh’s Zoonotic and Emerging Diseases webpage or on ILRI’s PAZ project blog site. The May 2010 issue of the Veterinary Record gives an excellent account of this ambitious human-animal health project: One medicine: Focusing on neglected zoonoses. Tracking of free range domestic pigs in western Kenya provides new insights into dynamics of disease transmission, 22 Mar 2013. Aliens in human brains: Pig tapeworm is an alarming, and important, human disease worldwide, 23 May 2012. Forestalling the next plague: Building a first picture of all diseases afflicting people and animals in Africa, 11 Apr 2011. This blog describes an episode about this project broadcast by the Australian science television program ‘Catalyst’; you can download the episode here: ABC website (click open the year ‘2011’ and scroll down to click on the link to ‘Episode 4’; the story starts at 00.18.25). Edinburgh-Wellcome-ILRI project addresses neglected zoonotic diseases in western Kenya, 28 Jul 2010.